A subfield of clinical psychology, behavioral psychology explores the links among experiences, thoughts, and behaviors. By understanding an individual's thought processes, practitioners with a master's in behavioral psychology develop effective, personalized techniques that positively modify their client's behavior. Working within behavioral psychology improves the lives of others, gives you options for specialization, and provides a stable career over a lifetime. According to the Bureau of Labor Statistics (BLS), psychologist employment will grow 14% by 2026, faster than the average for all occupations. Students completing a master's in behavioral psychology online take courses like child development, interventions for individuals with autism, ethical and professional conduct, and behavioral development. Top programs emphasize both qualitative and quantitative research, and clinic hours or supervised field experience serve as a common requirement for completing a master's in behavioral psychology. Schools vary in their completion requirements. Several programs require a capstone project or a final exam in addition to sitting for the behavioral analyst certification exam. While predominantly online, students should check if their online master's in behavioral psychology program requires an on-campus component. Most degrees take a minimum of two years to complete. As treatments typically address specific populations or conditions, such as autism or alcoholism, students should choose a program that suits their particular interests. 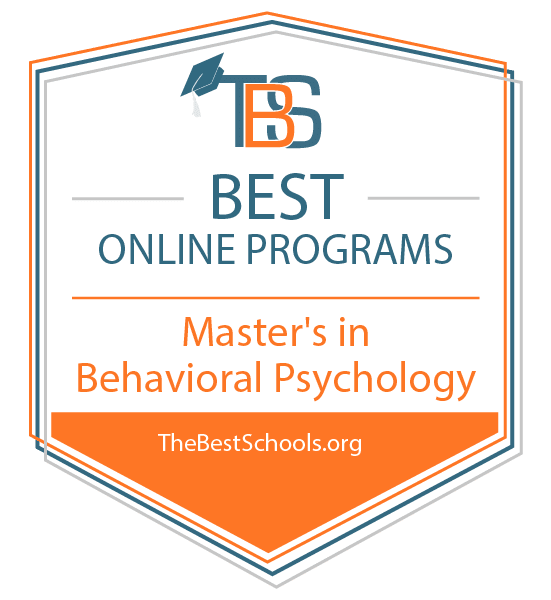 Most master's in behavioral psychology online programs contain unique coursework selections and specializations but still focus on applied behavioral analysis and certification preparation. Areas of concentration include special education, experimental analysis, and care for individuals with autism. What Else Can I Expect From an Online Master's in Behavioral Psychology Program? University of South Florida ranks #1 on The 10 Best Online Master's in Behavioral Psychology Degree Programs! Established in 1956 in the city of Tampa, the University of South Florida offers a master of arts in applied behavior analysis online. With a graduate student population of approximately 11,400 students, USF is a metropolitan public research university with extensive resources. The school's applied behavior analysis program prepares distance learners to become board-certified behavior analysts, teaching them skills related to psychology practice and research. The curriculum can be completed entirely online in as few as five semesters. 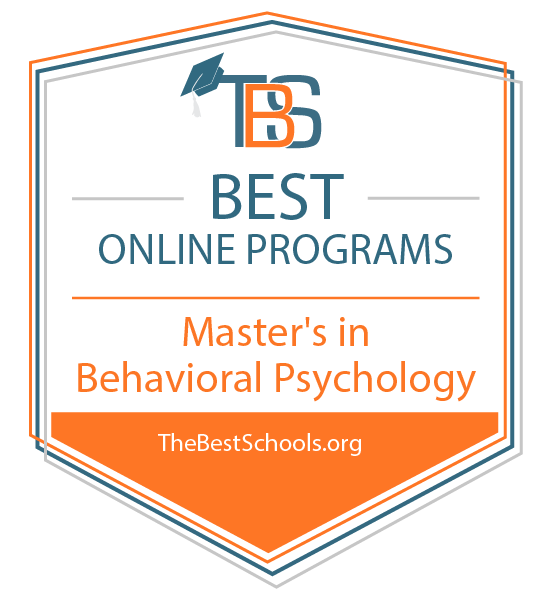 Students who graduate from this online master's in behavioral psychology program have a high pass rate on the Behavior Analyst Certification Board exam and go on to work in fields related to developmental disabilities, autism, education, rehabilitation, mental health, and business and technology. In total, degree candidates must complete 41 credits. Among these requirements is a 15-credit practicum and a research project. Prospective students must hold a bachelor's degree from a regionally accredited institution earned with a minimum 3.0 GPA. They should also have a background in applied behavior analysis, in the form of either experience or prior coursework, and access to a board-certified behavior analyst who is willing to provide supervision during the program. Distance learners can apply for competitive graduate assistantships and scholarships. USF is regionally accredited by the Southern Association of Colleges and Schools Commission on Colleges (SACSCC). University of Cincinnati ranks #2 on The 10 Best Online Master's in Behavioral Psychology Degree Programs! Established in 1819, the University of Cincinnati is a public research institution and a part of the University System of Ohio. The school offers a master of education in foundations in behavior analysis, which provides learners with foundational knowledge related to applied behavior analysis, education, and psychology. This master's in behavioral psychology requires no on-campus attendance and can be completed entirely online. In many cases, UC graduates go on to apply this knowledge to their psychology practices and conduct research to support children with disabilities. The curriculum at UC includes six courses that helps students earn a behavior analysis graduate certificate and four courses that examine the educational and psychological foundations of school psychology. Faculty members deliver courses in 15-week sessions. Distance learners can complete their degrees in is few as five semesters (20 months), depending on the number of classes they take each term. Prospective students should hold a bachelor's degree (earned with a GPA of 3.0 or higher) from a regionally accredited institution with a focus in a related area of study, such as applied behavior analysis, education, psychology, social work, or mental health. Applicants need not submit their GRE scores. Additionally, up to nine graduate-level credits from a regionally accredited college or university may be transferred toward this degree. Ball State University ranks #3 on The 10 Best Online Master's in Behavioral Psychology Degree Programs! Located in Muncie, Indiana, Ball State University is a public research institution composed of eight academic colleges with a student body of approximately 22,500 individuals. Ball State offers a master of arts in applied behavior analysis with an emphasis in autism. This program prepares students for careers as teachers, psychologists, therapists, and other human service professionals who work in schools, hospitals, mental health centers, and residential facilities. Degree candidates explore different ways to help clients improve their language, motor, social, and reasoning skills. The program's curriculum can be completed entirely online, with no trips to campus required. Faculty deliver distance coursework through the Blackboard learning management system in both synchronous and asynchronous formats. This degree consists of 30 credits, and students who take one or two courses per semester can earn their diploma within two years. Competitive applicants should hold a bachelor's degree from a regionally accredited institution earned with a GPA of 2.75 or higher. Students do not need to submit their GRE scores. Distance learners may transfer up to nine graduate-level credits toward this master's degree if those credits were earned from a program approved by the Behavior Analyst Certification Board. Arizona State University–ASU Online ranks #4 on The 10 Best Online Master's in Behavioral Psychology Degree Programs! Arizona State University, established in 1885, is one of the largest public universities in the U.S. and currently serves a student body of over 80,000 individuals. ASU has five campuses in the Phoenix metropolitan area and offers over 150 online programs. Among these programs is the school's online master of education in curriculum and instruction (applied behavior analysis), which requires distance learners to complete a total of 10 classes. Each class is three credits and takes eight weeks to complete. The curriculum is pre-approved by the Behavior Analyst Certification Board and prepares graduates to sit for the board certification exam. Online master's students in behavioral psychology explore foundational principles and concepts by taking courses like behavior analysis for exceptional populations, ethics of applied behavior analysis, behavior assessments, and research methods in the field. Graduates can move on to work as school psychologists, marriage and family therapists, CTE teachers, counselors, and social workers. Competitive applicants to this master's in behavioral psychology online degree program should hold a bachelor's or master's degree in any field from a regionally accredited institution earned with a minimum GPA of 3.0. Prospective students must submit a personal statement, a resume, proof of English proficiency, and three letters of recommendation. However, the program does not require applicants to submit their GRE scores. George Mason University ranks #5 on The 10 Best Online Master's in Behavioral Psychology Degree Programs! George Mason University, founded as an independent institution in 1972, is located in Arlington, Virginia, and educates a student body of 34,000 learners. This public university offers an online master of education in special education with an emphasis in applied behavior analysis, wherein students investigate the complex learning needs of individuals with disabilities. Degree candidates enrolled in this program choose between two supporting graduate certificate tracks: autism spectrum disorders or applied behavior analysis. These certificates feature 15 and 18 credits of specialization-related coursework, respectively. Students who who do not wish to earn a full master's degree can also opt to pursue standalone certificates. The full curriculum consists of 30 credit hours, including a residency or field experience and a capstone project. Program graduates can pursue work as school administrators, interventionists, psychologists, and speech and language pathologists. Those who earn a master's in behavioral psychology with the applied behavior analysis specialization qualify for employment as registered behavior technicians and psychologists for special needs patients; they can also work in community programs at hospitals, clinics, and schools. Although not explicitly required to gain admission into the program, applicants with experience in industry or an education-related field receive preference. GMU is regionally accredited by the Southern Association of Colleges and Schools Commission on Colleges (SACSCC). Northeastern University ranks among The 10 Best Online Master's in Behavioral Psychology Degree Programs! Northeastern University if one of Boston's top private research universities. Established in 1898, the school currently has a student population of approximately 25,500 and features a diverse catalog of online degrees. Among these offerings is an online master of science in applied behavior analysis. This degree prepares students to take on supervisory roles as behavior analysts at service agencies and private schools and act as independent consultants. Graduates help children and adults with autism and other disabilities develop independence in their daily routines. In this practitioner-focused program, distance learners investigate methods for teaching patients to effectively communicate with others, participate in community activities, develop academic skills, and engage in positive social interactions. Online master's students in behavioral psychology have the opportunity to learn through hands-on experiences, work in groups on team projects, and configure their coursework and electives to match their academic interests. This program also helps young and developing professionals network among their peers and prepares graduates to sit for the Behavior Analyst Certification Board exam. Applicants to this program must hold a bachelor's degree from an accredited college or university earned with a minimum GPA of 3.0. Prospective students should also submit a written statement of purpose and three letters of recommendation; however, applicants need not submit their GRE scores. Drexel University ranks among on The 10 Best Online Master's in Behavioral Psychology Degree Programs! Located in the University City neighborhood of Philadelphia, Pennsylvania, Drexel University is a private research institution with a student body of 26,000 individuals. Among the school's many offerings is an online master of science in applied behavior analysis degree program, which prepares students to assume roles in clinical, behavioral health, and educational settings. This master's in behavioral psychology program prepares graduates to work as special education teachers, school psychologists, social workers, and case managers. The coursework featured in this degree track is verified by the Behavior Analyst Certification Board, preparing distance learners to sit for the certification exam. Degree candidates pursuing this master's in behavioral psychology online choose from a practicum concentration or an autism spectrum disorders concentration. The autism concentration emphasizes communication, language skills, and research-based approaches, while participants in the practicum concentration engage in 750 hours of hands-on experience at regional mental and behavioral healthcare centers. Applicants must hold a bachelor's degree from a regionally accredited institution earned with a minimum GPA of 3.0. Prospective distance learners should also submit a personal essay, a resume, and two letters of recommendation. Students complete an admissions interview prior to being fully accepted into the program. Drexel is regionally accredited by the Middle States Commission on Higher Education (MSCHE) and the Council for Higher Education Accreditation. California University of Pennsylvania ranks among on The 10 Best Online Master's in Behavioral Psychology Degree Programs! California University of Pennsylvania, located about 30 miles south of Pittsburgh, was founded in 1852. This public university offers a master of education in applied behavior analysis distance program with three concentration tracks: autism, general, and autism spectrum disorders. All three tracks of this online master's in behavioral psychology can be completed entirely remotely without any on-campus obligations. Cal U's online curriculum features classes and training that prepares graduates to work with children who have autism and other disabilities. Students also complete an intensive practicum experience where they study under board-certified behavior analysts. Cal U is one of only a few universities In Pennsylvania that teaches the coursework required to sit for the Board Certified Behavior Analyst exam. Applicants must hold a bachelor's degree earned with a minimum GPA of 2.8. The GRE is not required for admission. Financial aid is available for those pursuing an online master's degree in behavioral psychology, and ~90% of the student population at Cal U receives financial aid. California University of Pennsylvania is regionally accredited by the Middle States Commission on Higher Education Accreditation. The online master's in education program is fully accredited by the National Council for Accreditation of Teacher Education (NCATE) and the Council for the Accreditation of Educator Preparation (CAEP). The Sage Colleges ranks among on The 10 Best Online Master's in Behavioral Psychology Degree Programs! The Sage Colleges is a private institution located in Troy, New York. Established in 1916, Sage educates a student body comprised of 3,000 undergraduate and graduate students. The school's master of science in applied behavior analysis and autism is offered entirely online and requires no on-campus obligations. Students choose between a hands-on practicum track and a non-practicum track. These curricula consist of 42 and 34 credits, respectively. In both cases, students can earn their degree in as few as two years. Participants who elect to follow the practicum track while earning a master's in behavioral psychology online meet the eligibility requirements for the Behavior Analyst Certification Board exam. Faculty deliver online classes asynchronously, and courses feature audiovisual presentations, active learning experiences, and fluency drills. Distance learners pursuing the practicum track also receive additional supervision from faculty at the school's center for applied behavior analysis. This program accepts applications on a rolling basis and admits students on a first come, first served basis each fall and spring semester. Prospective students must submit a resume, a career goals statement, and two letters of reference. Competitive applicants will have already taken some courses in statistics, research design, or experimental methods. The Sage Colleges is regionally accredited by the Middle States Commission on Higher Education (MSCHE). Southern Illinois University - Carbondale ranks among on The 10 Best Online Master's in Behavioral Psychology Degree Programs! Southern Illinois University is a public research institution with a student population of approximately 14,500 individuals. The school offers a master of science in behavior analysis and therapy through a hybrid program. Students take 75% of coursework online and complete the remaining 25% in face-to-face classrooms in Lenox, Illinois. These mandatory in-person class sessions, typically scheduled on Friday evenings or Saturday mornings, meet at least three times per semester. Required coursework covers basic behavior principles, legal and ethical issues in behavior analysis, and staff training and development. Students also take two elective courses, choosing from from classes such as child behavior and behavior analysis in developmental disabilities. Additionally, all distance learners complete an internship in rehabilitation under the supervision of a faculty member; most degree candidates begin this internship after completing two semesters of coursework. Finally, to end the program, learners choose between completing a research paper or a thesis project. SIU awards more than 10 million dollars in scholarships each year, and online graduate students can apply for fellowships and scholarships. Program participants may also work as graduate assistants. SIU is regionally accredited by the Higher Learning Commission (HLC). The online master of science in behavior analysis and therapy program is accredited by the Association for Behavior Analysis International (ABAI). While details vary between schools, master's in behavioral psychology online programs prepare students for certification exams, entry-level careers, and doctorate degree applications. The curriculum gives learners not only a theoretical foundation for caregiving but also the ability to develop treatment plans and conduct research. Applied Behavior Analysis in Autism and Developmental Disabilities: This course focuses on autism education, ABA treatment design, and research applicability. It emphasizes expanding clients' communication skills and implementing behavioral interventions. Students leave prepared to work as an assistant behavioral analyst. Research and Experimental Design: This course provides an overview of empirical research and its use in behavioral interventions. As treatment here differs from traditional psychology, students learn to distinguish between ABA research versus single-study research. Emphasis lies with data collection, research validity, and ethical issues in research-based careers. Behavior Analysis in Education: Focused on educational settings, this course explores how to apply research-based behavioral modification strategies. Learners examine how to foster positive social behaviors in students and how to assess intervention effectiveness and outcomes within an educational setting. Board Certified Behavioral Analyst: BACB certification serves those hoping to enter the workforce as independent ABA practitioners directly after their master's in behavioral psychology degree. Professionals with this certification work in a variety of settings and with various populations, including individuals with autism, developmental disabilities, and addiction struggles. Certification requires a graduate degree, coursework in ABA, and supervised practical experience. Certified Autism Specialist: The International Board of Credentialing and Continuing Education Standards offers a certificate that indicates specialization in services for individuals with autism. Completing this certification enhances your professional reputation, increases employability, and may increase your overall earnings. Certification requires a master's in behavioral psychology or related field, two years of work experience with individuals with autism, additional continuing education credits, and a competency exam. An online master's in behavioral psychology prepares learners for their behavioral analyst certification. Common occupational fields include cognitive behavioral therapy, special education, social work, and substance abuse counseling. Certified analysts enjoy the opportunity to choose their setting and the population with which they work. Psychologist: Behavioral psychologists analyze how individuals interpret their environment and how this affects their thoughts and behaviors. They also suggest treatment methods for improving mental processes and disordered behavior. A master's degree enables them to obtain an assistant or behavior analyst position in behavioral psychology. Social Worker: Social work aims to improve the well-being of an individual. Clinical behavior analysts can work alongside clinical social workers (who assess, diagnose, and treat behavioral issues) to provide behavioral management services and interventions that complement the CSWs' focus. Certification as a analyst requires completion of a master's in behavioral psychology and a competency exam. Counselor: Counselors with their master's in behavioral psychology often work with patients dealing with substance abuse issues, behavioral disorders, and mental health conditions. They modify problematic behaviors and practice in a variety of locations, including private practices or community health centers. Counselors typically need a master's degree. When selecting a master's in behavioral psychology online program, confirm each school's accreditation status. Accreditation indicates that you will receive a quality education. Overseeing accrediting bodies ensure that schools meet or exceed universally recognized standards. Schools receive regional accreditation from one of six regional accrediting bodies recognized by the Council of Higher Education Accreditation (CHEA). Schools receive national accreditation from one of 10 agencies, also approved by the CHEA. Regional accreditation serves as the more prestigious designation. National accreditation typically evaluates technical and vocational schools that provide a career-oriented curriculum. Look for accreditations such as the New England Association of Schools and Colleges (Regional) or the Distance Education and Training Council (National) in your research. Schools offering an online master's in behavioral psychology often enjoy accreditation from the Association for Behavior Analysis International, which focuses on research dissemination and continuing education in the ABA field. Additionally, the BACB Verified Course Sequences signals that the necessary prerequisite coursework for the behavioral analyst certification exam appear in the curriculum. Several organizations assist in career development for students and recent graduates of the online master's in behavioral psychology. They provide continuing education courses, networking opportunities, and career services. Professional affiliations also lead to research funding opportunities, and the many different annual conferences serve as an excellent way to gain field exposure and remain active. Joining these professional organizations after graduation not only improves students' career development, but also helps expand the knowledge base of this ever-evolving field. Association for Behavior Analysis International: In addition to accrediting schools, the association offers access to seminars, conferences, professional networking, continuing education online tutorials, and additional career services. American Psychological Association Behavioral Analysis Division: This division of the APA focuses on behavioral analysis and scientific research. Members receive a newsletter twice annually and enjoy access to the APA convention, special events, social hours for networking, and additional educational presentations. Association of Professional Behavior Analysts: This association provides resources and works with federal, state, and governmental parties to support analysts. Membership requires a certificate in behavioral analysis, and members receive newsletters, educational resources, and reduced pricing for liability insurance and conference attendance.